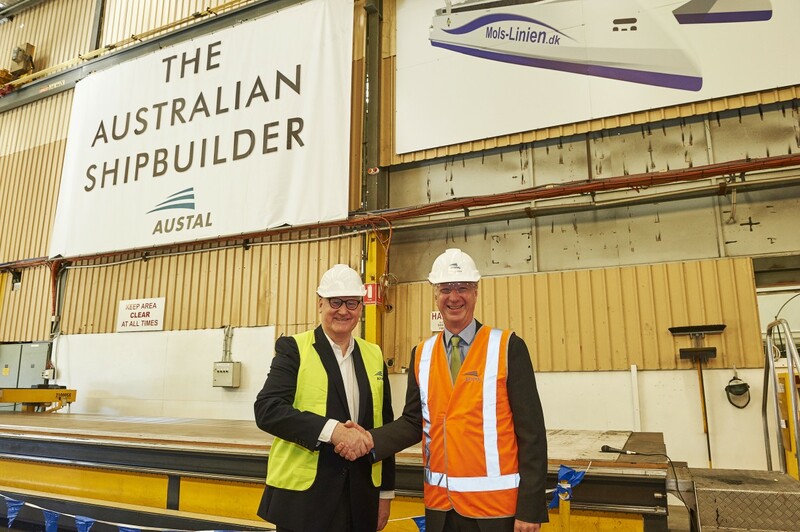 Austal (ASX:ASB) is pleased to announce the start of construction of the 109 metre high-speed catamaran ferry ‘Express 4’ for Molslinjen (OMX:MOLS) of Denmark, with the first plate-cutting conducted at Austal’s shipyard in Western Australia. Molslinjen Chairman, Frantz Palludan officially initiated the aluminium plate cutting for Austal’s largest commercial ferry project since 2011 and the largest commercial ferry (by volume) in the company’s 28 year history. Mr Palludan was joined by Soren Jespersen, Vice Chairman of Molslinjen and Magnus Psilander of Grifone Shipbrokers AB at the plate cutting ceremony which was hosted by Austal Chairman John Rothwell and Chief Executive Officer David Singleton. Highlighting the vessel’s new, customised design, David Singleton said the vessel represented the very latest in high-speed catamaran technology, delivering an optimum ferry solution for Molslinjen. “Austal’s unique 109 metre high speed catamaran gives Molslinjen a true, competitive advantage and the very best offering to the travelling public and commercial vehicle operators. This vessel will set a new standard for speed, comfort and efficiency,” Singleton added. ‘Express 4’ will be the fourth high-speed catamaran ferry launched by Molslinjen in just 6 years and reflects the continuing success of the company, which has seen a 46% increase in passenger numbers across its network since 2011. Employing more than half of the 600-strong workforce at the Henderson shipyard, including many of the 100 new apprentices to be recruited in 2017, Austal is on schedule to deliver ‘Express 4’ in late 2018. Austal is a global defence prime contractor and a designer and manufacturer of defence and commercial ships. For more than 28 years Austal has been a leader in the design, construction and maintenance of revolutionary ships for Governments, Navies and Ferry operators around the world. More than 255 vessels have been delivered in that time. Defence vessels designed and built by Austal include multi-mission combatants, such as the Littoral Combat Ship (LCS) for the United States Navy and military high speed vessels for transport and humanitarian relief, such as the Expeditionary Fast Transport (EPF) for the United States Navy and High Speed Support Vessel (HSSV) for the Royal Navy of Oman. Austal also designs, constructs, integrates and maintains an extensive range of patrol and auxiliary vessels for government agencies globally, including the Cape Class Patrol Boat Program for Australian Border Force. Defence vessels are designed and constructed in Mobile, Alabama and in Henderson, Western Australia. Austal has been at the forefront of the high speed ferry market since the early days of the industry. Our market leading designs of high performance aluminium vessels have long been at the heart of Austal’s research and development. Today, commercial ship construction is centred on our shipyard in Balamban, Philippines. Austal has expertise in integrating complex systems into its ships, including ride control, ship management, and communication, sensors and weapon systems. Austal provides a wide range of support services, including through life support, integrated logistics support, vessel sustainment and systems support. These services are delivered through our global support network in the USA, Australia, Asia, and the Middle East together with partner shipyards worldwide.